Concord, Mass. - Concord-Carlisle's senior-laden starting lineup is playing with a sense of urgency. Senior captains John Mulligan, Spencer Patenaude, and David Poor combined to score 54 points in the Patriots’ 69-59 victory over the Bedford Buccaneers on Monday night in Concord. The win gives Concord-Carlisle (16-6) a share of the Dual County League Small division regular-season title with rival Weston. C-C head coach David Cohen said that having a senior-laden squad can pay big dividends come tournament time. “Having guys that are battle-tested and older always comes (in handy),” Cohen said after the game. Cohen added that there are no disadvantages to having players with big-game experience. One of those seniors, Mulligan, was coming off a career night against Weston, in which he scored 30 points on eight 3-pointers. Mulligan scored 8 points, including two 3-pointers, in the first quarter against Bedford (13-6). Mulligan finished with 16 points, 4 assists, 2 rebounds, and a steal. After a layup by Poor (game-high 20 points, 8 rebounds, 2 blocks) put the Patriots ahead 16-8, the Buccaneers closed the first quarter on a 9-4 run, capped off by a three-pointer by sophomore Rahim Williams (team-high 16 points) that cut the Concord-Carlisle lead to 20-17 at the end of the first quarter. In the second quarter, Concord-Carlisle was firing on all cylinders. Mulligan assisted on two layups by Poor and also hit two free throws. Patenaude, who finished with a double-double (18 points, 13 rebounds) drilled two three-pointers, one to begin and one to punctuate a 12-0 run by the Patriots. Patenaude said that he tried to be aggressive when going up for rebounds and took shots whenever he had an open look. Defensively, the Buccaneers’ first bucket of the quarter came on a layup by senior Cameron Shelmire with 2:18 remaining in the second period. Coach Cohen said that his team tried to run Bedford off the three-point line, and wanted to prevent Bedford from finding a rhythm on offense. Shelmire’s layup sparked a 8-0 run by Bedford to close the second quarter. Concord-Carlisle’s halftime lead was 32-25. Both teams found ways to put the ball in the basket in the third period. Bedford drove aggressively to the basket, which led to layups and trips to the foul line. Williams, senior Colin Doyle, and sophomore Panayiotis Kapanides led the charge, as the trio combined to score 13 of Bedford’s 17 points in the third period. Senior Tim Cowen also played well in the third quarter for the Buccaneers. Cowen made four free throws during the period, and played aggressively on defense throughout the contest. He finished with 12 points, 9 boards, and 3 steals. The Patriots moved the ball well on offense, which led to layups and open three-pointers, including two more shots from behind the arc by Patenaude. Coach Cohen said that moving the ball can cause confusion for opposing defenses and opens up the floor more, which leads to more uncontested shots. Patenaude added that “everyone (made) the right plays on offense” and that ball movement was key to his team’s success against the Buccaneers. The Concord-Carlisle advantage stayed between 4 and 9 points throughout the third quarter, and the Patriots took a 52-44 lead into the fourth period. The Patriots looked to put the game away when they went up by ten points on a baseline jumper by Patenaude with 4:21 remaining in the contest. 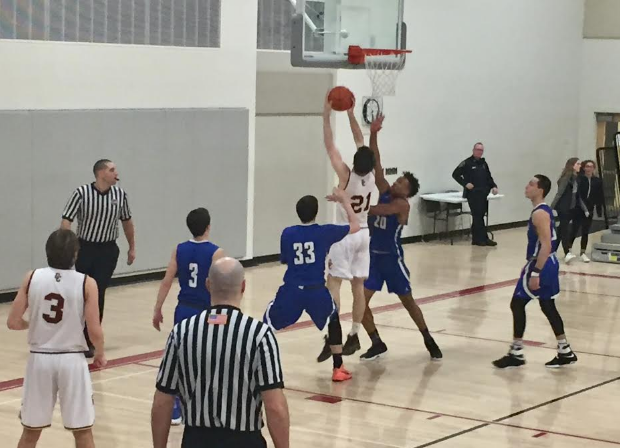 Bedford responded with a jumper by Kapanides and a long three-pointer by freshman Malachi Hazelton, which diminished the Buccaneers’ deficit to 60-55 with 2:12 left in the fourth quarter. Concord-Carlisle countered with a pair of free throws by senior Will Palmer (10 points), which were part of an 8-0 run that put the game away for the Patriots. Coach Cohen took out all five of his starters in the final 30 seconds as Concord-Carlisle clinched a share of the league title on its home floor. Concord-Carlisle never trailed in this game, and their starters showed the ability to carry their team to victory. The Patriots moved the ball well on offense and did not allow the Buccaneers to get hot from behind the arc. Concord-Carlisle, which went to the Division 2 state final last season, has plenty of experience and is playing well at the right time. The Patriots will conclude their regular season on Wednesday when they host Billerica. The Buccaneers can take some positives away from this game. They continued making runs to keep the game close, and were never out of the contest until there was under a minute remaining. They also played aggressively on defense and forced ten turnovers. With its regular season complete, Bedford will now turn its attention to defending their 2016 Division 3 North Sectional title.